Spruced Up Cheese Spread recipe - CRAZY good!!! People go nuts over this dip!! 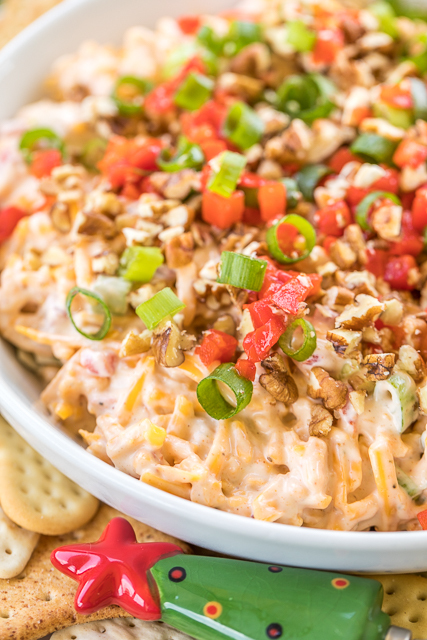 It is like pimento cheese on steroids - pimento, onion, mayonnaise, mustard, Worcestershire sauce, celery seed, paprika, garlic salt, cheddar cheese and pecans. Serve with crackers and veggies. Can make several days in advance and refrigerate until ready to serve. This is always the first thing to go at parties!! SO good! This Spruced Up Cheese Spread is a MUST for all your holiday parties. This stuff is CRAZY good!! We took one bite and were transported to foodie heaven. 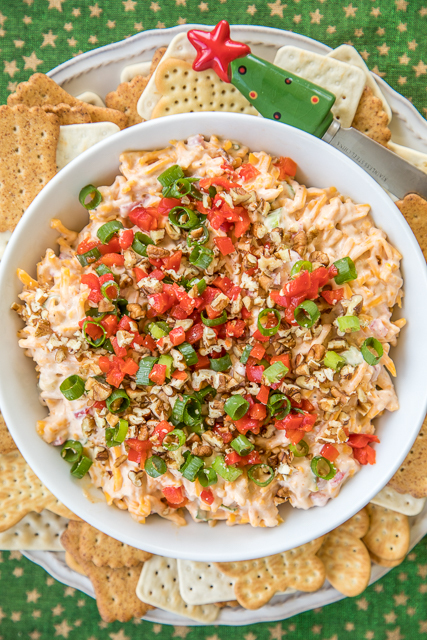 This Spruced Up Cheese Spread is like pimento cheese on steroids. It is loaded with tons of great spices, and the pecans really put it over the top. I couldn't walk past this cheese spread without taking a bite. SO good! 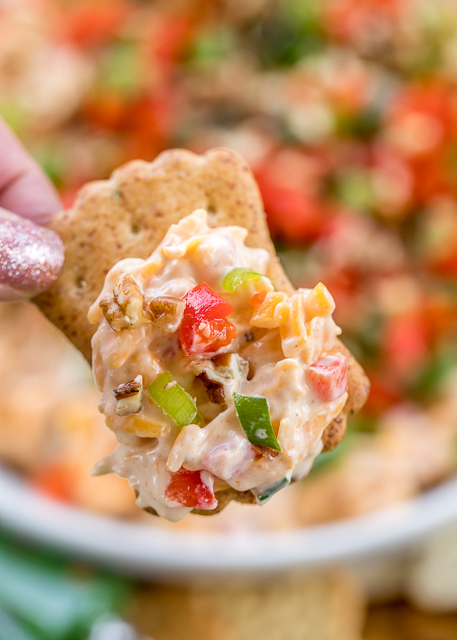 This Spruced Up Cheese Spread is great for parties! You can make it a day or two in advance and keep it refrigerated until you are ready to serve. We served it with some crackers. It would also be great with celery sticks! You could even slice up some bell peppers to serve with this cheese spread. I am making a batch of this Spruced Up Cheese Spread to take down to my parent's house for Christmas. This is perfect for snacking on while waiting on Santa! Set aside 2 Tbsp of pimentos for topping. Combine remaining pimentos, onion, mayonnaise, mustard, Worcestershire sauce, celery seed, paprika and garlic salt. Stir in cheese. Transfer to a serving bowl. 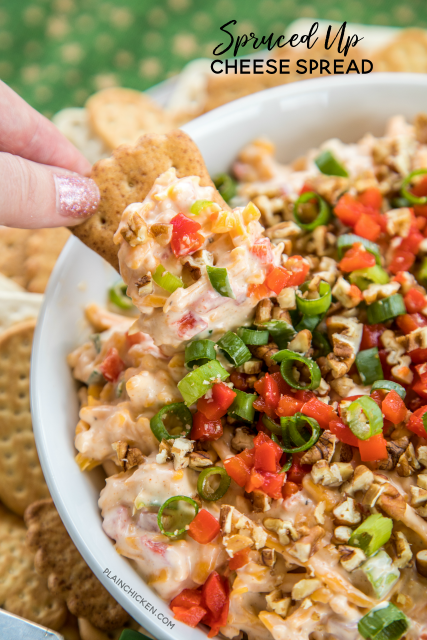 Sprinkle with pecans and reserved pimentos. Serve with crackers.